Hello friends! I am back with Part 2 of my Fall Trends series, and today I am talking about embroidery. (If you missed Part 1 of this series, click here to read more about my love for bell sleeves.) Unless you have been living under a rock lately, you have probably seen that embroidery is everywhere…tops, jeans, shoes, purses…you name it! Embroidery can add an interesting touch to anything! As a big believer in not spending a bunch of money on trendy clothing, I’ve found some great pieces with embroidery for really affordable prices. Every embroidered piece pictured here is under $40! This military jacket was one of the first things I bought with embroidery on it. It is a classic olive cargo jacket but has some embroidered flowers on the sleeves So cute, right?! It is under $40, so super affordable too. You can easily throw this on with a simple tee and jeans and look instantly on trend. It also would look cute over a dress with some casual sneakers. Be sure to size down in this jacket, as it does run big. Embroidery is popping up lately on jeans too. Admittedly, some of the embroidered jeans are a little too wild for me. This cute pair provides a subtle touch with some pretty embroidered flowers, but are just understated enough to not look too busy. Like the jacket, the jeans are also affordable at under $40! Pair these jeans with a simple top or cardigan and you are ready to go. Last but not least, you can find embroidery on various styles of shoes right now. 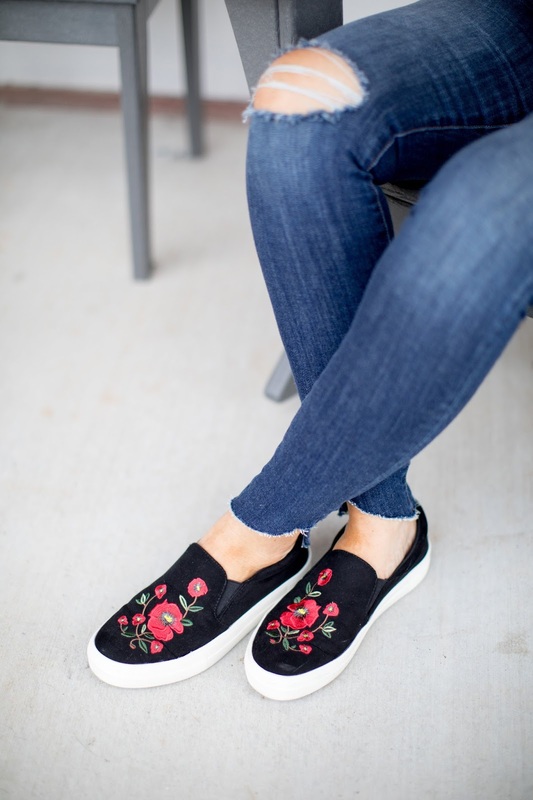 If you aren’t sure about incorporating this trend on your clothes, embroidered shoes are a great option. 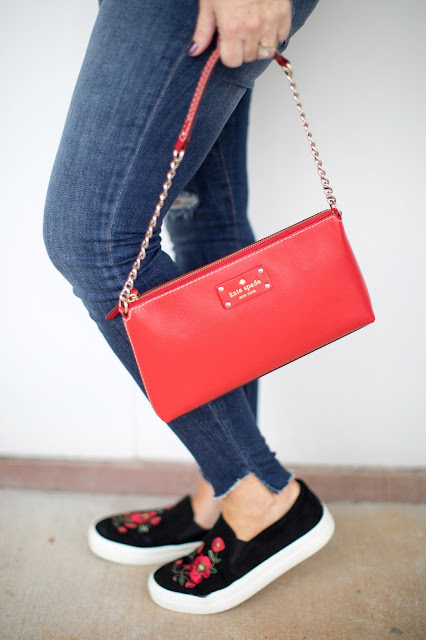 Here is a cute casual option that is black with red and green flowers, so they go with so much. I pair these sneakers with anything red, black or white and every time I wear them I get so many compliments. They are under $30, so you won’t break the bank while looking fashionable. I hope you enjoyed seeing a few ways to incorporate some embroidery in to your wardrobe. Please be sure to check back next Tuesday for the final part of my Fall trends series. If you aren’t already getting my blog posts delivered directly to your inbox, subscribe by adding your email address in the box to the right of this post. Thanks for visiting Smart Southern Style! Loving this new blog! What a pleasant surprise. You are gorgeous and the embroidery is adorable. I couldn’t agree more about your target demographic. I can’t wait to see what’s next. Thanks so much! I appreciate you following along!